It's very rare to get Malaysian hawkers online. I mean to setup their own website or blog to promote their food. This is also true for restaurants too, you can only find handful of them with website. Even they have, the site is likely to be static html pages or with many java script errors. http://onlyonemangojuice.blogspot.com. It's actually too long to type. I just don't know how to describe the taste. I think I had 2 or 3 cups on that night. Go try it even if you are full, the sweetness and sourness of the juice will sure reopen your appetite. 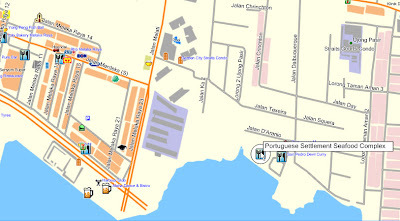 You can find it in MFM map, just search for Portuguese Settlement. Visit the blog too, with occasion updates, even more advance than Jacko.MY with Facebook link, Nuffnang etc.